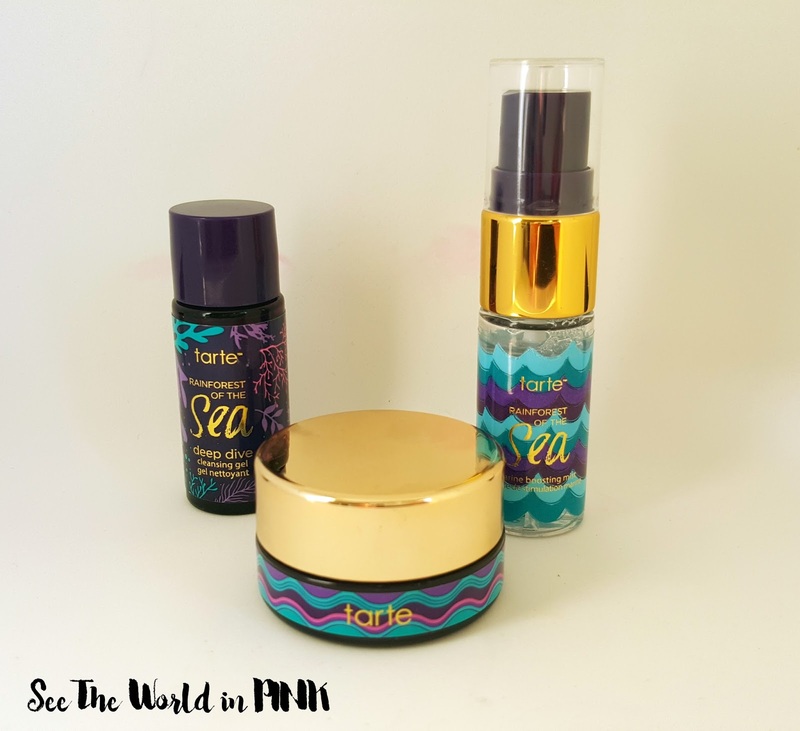 tarte Rainforest of the Sea™ Make A Splash Hydrating Skin Savers ~ $12.00. Achieve stunning skin with this skincare starter set, featuring tarte’s skin-boosting products in deluxe sizes. Powered by the exclusive Rainforest of the Sea complex, this hypoallergenic trio cleanses, clarifies, hydrates, refreshes, and protects skin with these deluxe, antioxidant-packed formulas. The Deep Dive Cleansing Gel is a sulfate-free, brightening facial cleanser for all skin types that removes excess oil, impurities, and all traces of waterproof makeup. Perfect for hydrating dry, dehydrated skin, the Drink H2O Hydrating Boost is a lightweight gel moisturizer that helps moisturizes and supports the replenishment of electrolytes. Extend the wear of makeup for 12 hours with the Marine Boosting Mist, a primer, setting spray, hydrating mist and skin refresher in one product. I love value sets to try new products before buying the full size set! This set includes the Deep Dive Cleansing Gel, the Marine Boosting 4-in-1 mist, and Drink of H2O Hydrating Boost. I do have to say that I was expecting these to be a little bigger, but I still think I will get quite a few uses out of them! 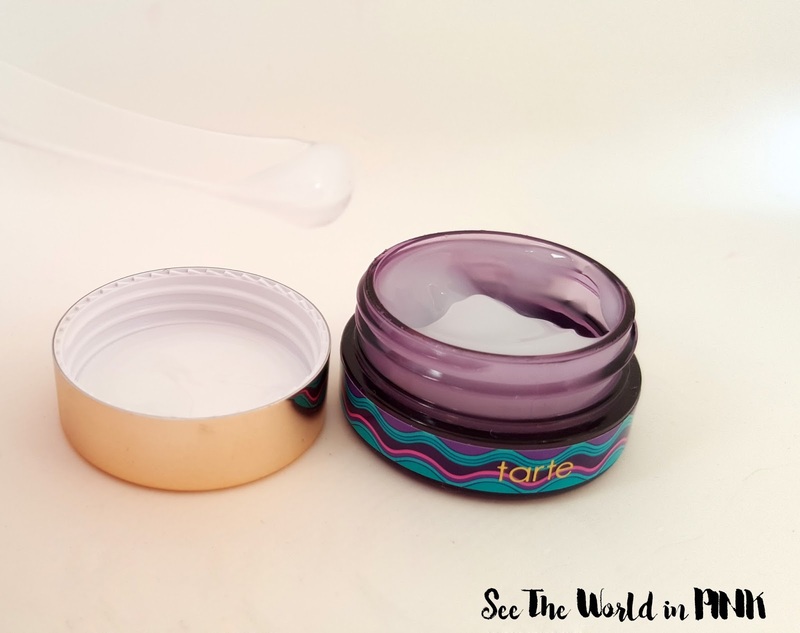 I do like to make sure that the value sets are worth what I have paid for the set - Tarte claims this set has a $28 value, so lets see if this is true! 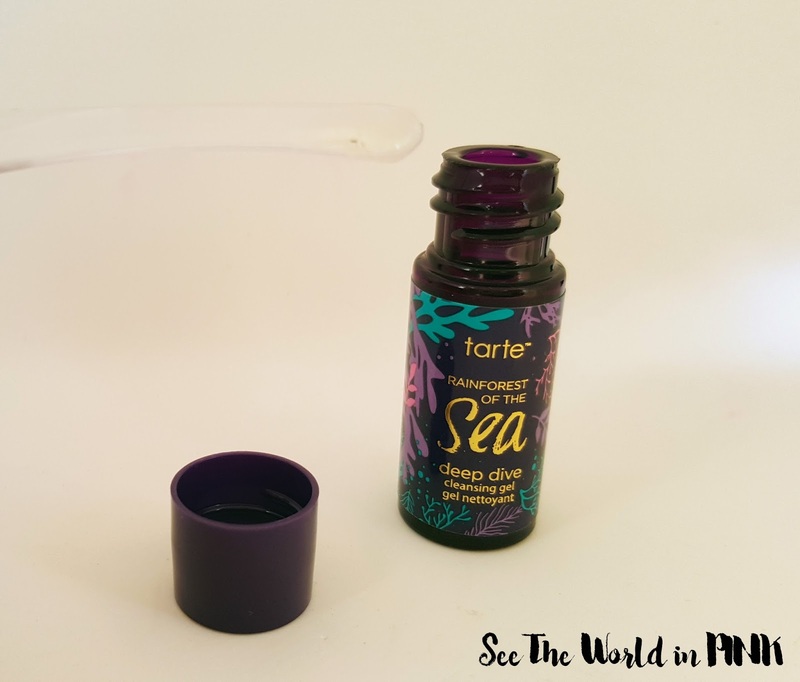 tarte Rainforest of the Sea™ Deep Dive Cleansing Gel ~ $30.00. A hypoallergenic daily facial cleanser that removes impurities and waterproof makeup. I really love gel cleansers - this is so gentle and refreshing in the morning. I don't generally use gel cleansers at night time; but, this worked very well after my oil cleanser too. It certainly got rid of any remnants of makeup and left my skin feeling cleaning, but not dried out! 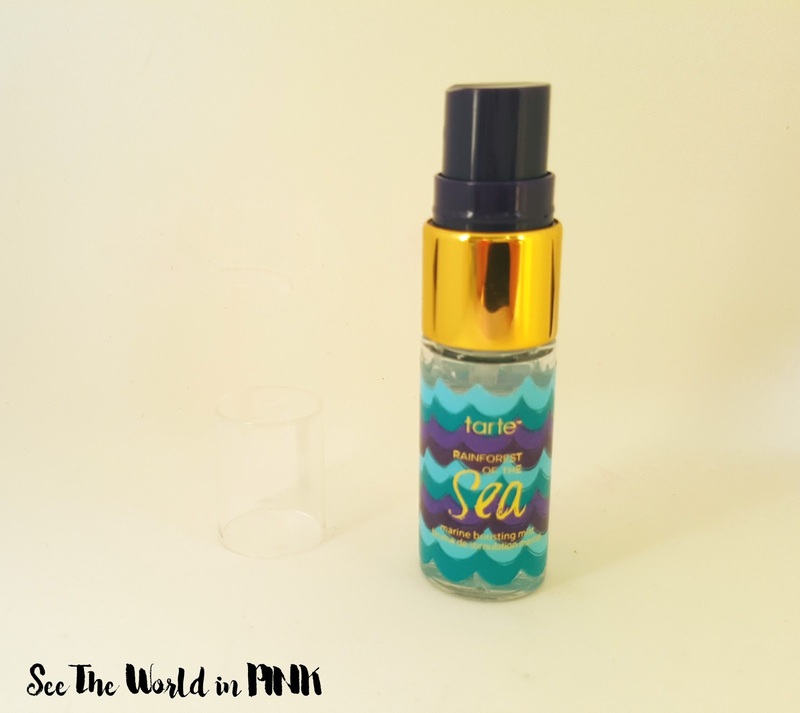 tarte Rainforest of the Sea™ Marine Boosting Mist ~ $30.00. A four-in-one primer, makeup setting spray, hydrating mist, and skin refresher. This mist smells really great - it is a very light, but refreshing scent! It's hard to describe, but the Rainforest of the Sea suits it nicely! This mist is very refreshing - I like that it is a 4-in-1 program and can be used in many ways! The mist sprays out nice and finely - I really love this mist. 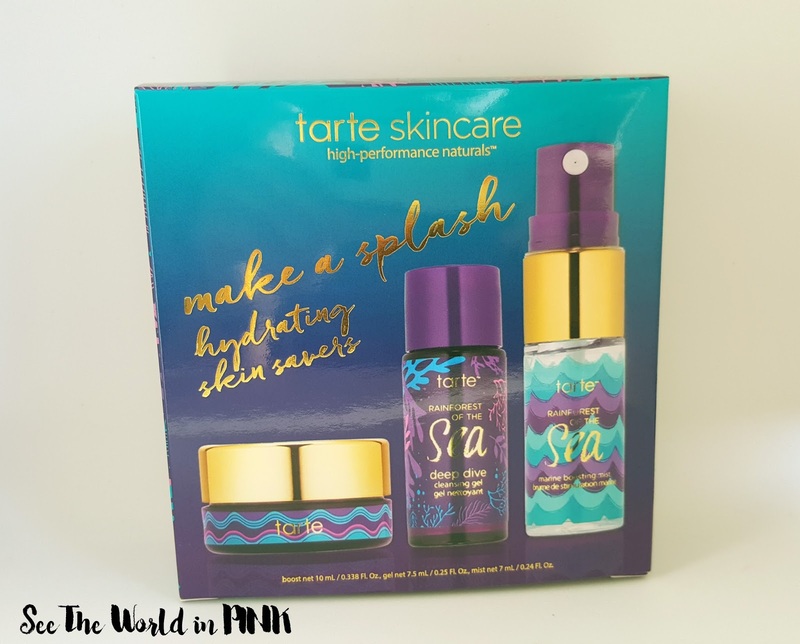 tarte Rainforest of the Sea™ Drink Of H2O Hydrating Boost ~ $47.00. A refreshing, lightweight gel moisturizer to help moisturize dry, dehydrated skin. This smells just like the mist - which I love! I have been loving gel moisturizers so much lately - they are the perfect texture for Spring skincare (nice and light, but gives tons of moisture!) I really enjoyed this moisturizer - it is perfect for daytime! While this value set didn't come with a huge value - it was over the $12 I paid and I enjoy deluxe sized items to try out products before buying full sized! I was happy with all 3 of these products and look forward to using them all!! Have you tried any of the Rainforest of the Sea collection yet?